Our last User Group in Fall of 2010 was a hot topic for months, (check here for User Group blog posts) not only because of the record number of attendees, but also because of our Community Server application - our online client request forum. Many clients sign into Community Server daily, not to enter new requests necessarily, but rather to see what others are interested in doing and any new tricks and ideas that are being discussed. Prior to opening registration for User Group, several people wondered if the online component would render the face-to-face meetings unwanted. Those who wondered soon realized that wasn't the case. As a marketing professional, the trade show aspect is especially interesting since it seems that only two years ago, this forum was becoming extinct with fewer and fewer attendees and smaller shows consolidating into single shows. Perhaps it was the economy and the caution to spend money more frugally. It is definitely less expensive to surf the web for information than potentially travel out of the area to view many vendors in one location. But is it as effective? There is something to be said for looking someone in the eye when asking a question. In just the past 12 to 18 months, all the talk seemed to revolve around social and online meetings. Virtual trade shows, Twitter updates, Facebook groups and ads. All of that is wonderful and extremely helpful in promoting a company with little cost. But in the last six of these months, I have seen a slight shift in use. This shift isn't about replacing one with the other, but rather creating more of a balance between a virtual meeting and a face-to-face meeting. Think about when you are on a long phone call with someone. Maybe it is just me, but I often find myself multi-tasking. Talking on the phone, checking email, filing papers, maybe even checking the weather on the computer. None of these things can be done, without being rude, when you are having that same conversation in person. At trade shows or User Groups, I want to see the Customer Relationship Management (CRM) module, I want to understand Quality Management, I have questions and I am fully engaged. In the end, virtual and social outlets provide the quick, accessible at-your-own pace qualities that make for convenient use of time. On the flip side, face-to-face still offers the tactile, touchy feely experience that, hopefully, makes everyone feel as if they are being listened to. So which method will dominate or will they find a natural balance? What are your upcoming plans? Do you plan to attend in-person shows or have you opted to only do virtual events? 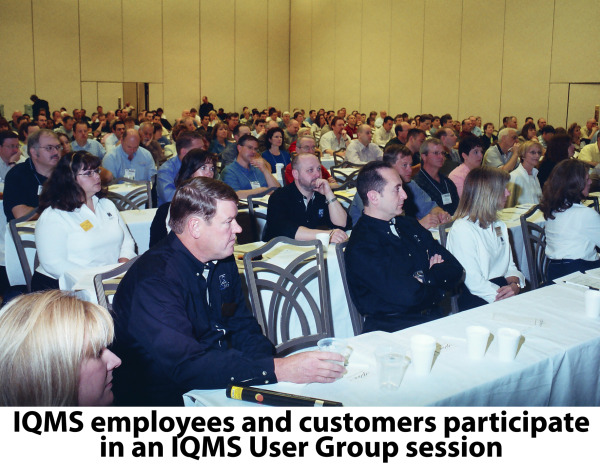 If you are an IQMS customer, do you have plans to attend the next User Group event?